I was reading Ouran High School Host Club Manga this week. Bisco-san the Mangaka of Ouran wrote in one of her side-bars that she absolutely loved Tamaki Suoh’s Character Song, and that whomever wrote the lyrics to it and made it so RIDICULOUSLY over-confidant is a genius. My first reaction was “OMG THAT WAS MY FAVOURITE SONG EVER BACK IN THE DAY!!! I NEED TO LISTEN TO IT RIGHT NOW!” It was 3 in the morning and I was about to go to sleep but I just HAD TO get up and Listen to it. So I found it on youtube and reminisced on how obsessed I was over this song and Tamaki in General. Although Kyoya is my favourite I am still totally in love with Tamaki and his Seiyuu – Mamoru Miyano (Who is also Tokiya Ichinose from Uta No Prince-sama) Who is officially my favourite Seiyuu EVER. Honestly the Lyrics in this Song are so very Tamaki that It makes me love this song even more! Bisco was so right to say that whom ever wrote these lyrics was a genius! I will post them up at the end of this post so you can take a look =). I also was wondering about the English version of this song. I personally love Vic Mignogna’s version of Tamaki Suoh’s voice like I said in my review of the Ouran BluRay. In fact, he is probably the first character English dub voice i’ve ever liked almost as much as the original. (No one can live up to the love I have for Mamoru Miyano though, his voice gives me ear-gasims every time I hear it) And as I was browsing through youtube I found that he’s done a version of the song as well. I was a bit sceptical because the English versions of the opening and closing theme are horrendous but I loved Tamaki so I listened to it as well. OMG WAS IT THE BEST EVER. Here it is so you can compare the two, BUT IM SO IN LOVE WITH THIS VERSION OF THE SONG TOO! The lyrics that they did in the English are very close to the original lyrics and they are so over the top, and Vic does an amazing job of singing it! It just works so well that you wouldn’t even know that this was not the original version of this song. I’m at the point where I love both versions equally, and I’ve been listening the two back to back on repeat for about 2-3 days now LOL. Nevertheless, I’ll still love you right? Nevertheless you’ll still touch me, right? Nevertheless, you’ll still find me charming, right? The quality is absolutely amazing obviously because it is in BluRay. The cover is beautiful and the art on each for the 3 BluRays are very cute! It includes all 26 episodes You have a choice between watching it in the Original Japanese audio or English Dubs. There are also English subtitles that are optional to view as well. THE OUTTAKES IN THE EXTRA FEATURES IS SO FREAKING HILARIOUS. I ALMOST PISSED MYSELF. IT WAS THAT FUNNY, THE ENGLISH VOICE ACTORS ARE SO DAMMMNNN FUNNY! This alone makes me so happy that I bought the BluRay set. Extras also include a select number of episodes with commentary and the opening and closing songs without text. I’m really happy that I have this BluRay set to cherish along with my Ouran Mangas. I think buying this was worth the money I paid for it and I’m excited that I can watch this over and over again in english and in japanese. All I need now is the missing mangas, BluRays of the Live Action show, and the Live action movie to complete my collection. 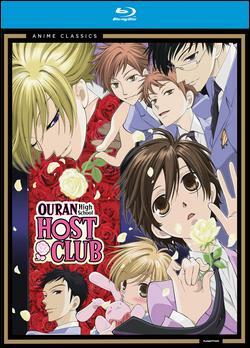 If you are an Ouran otaku like me then getting this BluRay will be one of the best things you’ve ever done!